MOSCOW (Sputnik) - Palestine is surprised that Israel, which has a number of advanced weapon systems, such as the Iron Dome missile defense system, is "afraid" of the protesting Palestinians, Palestine’s Ambassador to Russia Abdel Hafiz Nofal told Sputnik on Friday. Earlier in the day, a mass protest, which is expected to last for over a month, started along the Israeli border. 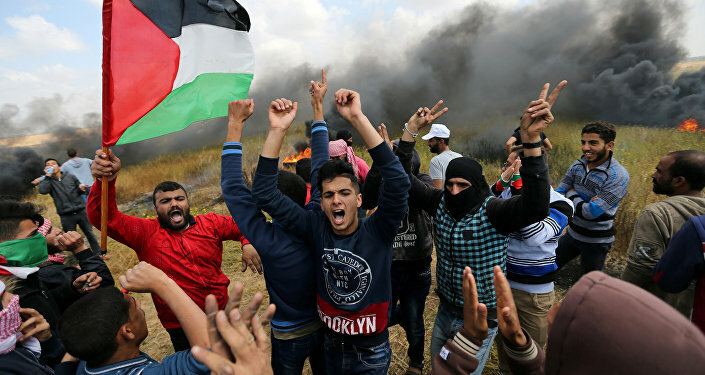 During the event, the protesters have already clashed with Israeli servicemen and reportedly twelve Palestinians were killed in the clashes, according to media reports. "The most surprising issue is that the state possessing the Iron Dome, missiles, one of the strongest armies in the world is afraid by a group of protesters. It is surprising," Nofal said answering a question about the Palestinian response to the US move. In 2018, Israel will receive $705 million on the development of missile defense systems, according to Israeli Defense Minister Avigdor Lieberman. The official specified that the funds provided by Washington would be allocated both on the development of new systems and serial production of the existing ones, such as Iron Dome. The diplomat added that the Palestinians do not have such advanced weapon systems, but have "a strong will and firmness." For decades, Israel has been in conflict with the Palestinians, who have been seeking diplomatic recognition for their independent state on the territories of the West Bank, including East Jerusalem, which are partially occupied by Israel, and the Gaza Strip.